Delegate Deb Rey for President? 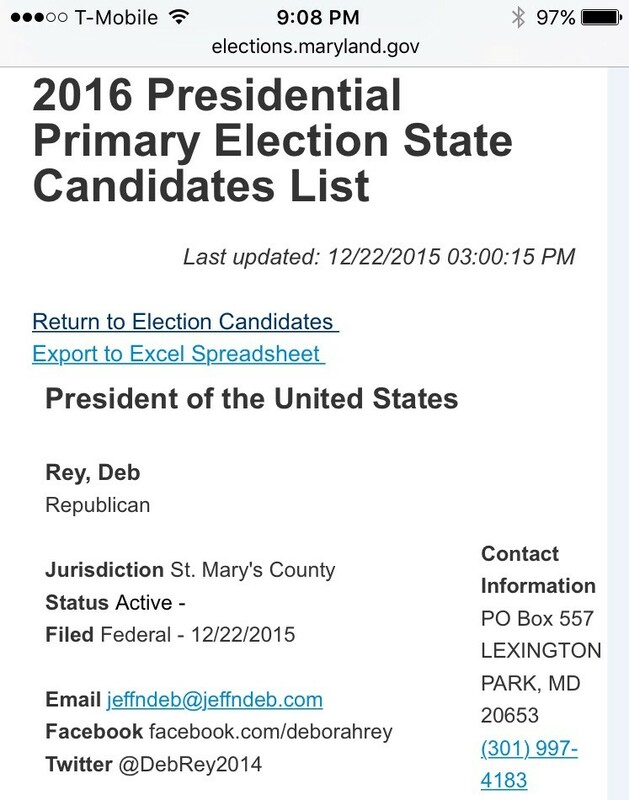 A bit of a surprise today, as a look at the State Board of Elections candidate list shows that Delegate Deb Rey has filed as a candidate for President. Delegate Rey has been vocal on social media in support of the Presidential campaign of Ted Cruz. One would have to imagine that this very well might be a misunderstanding more than it is anything else. I’ve reached out to Delegate Rey for a clarification as to whether or not this is accurate. More information on this as it becomes available. UPDATE, 10:49 PM: I just spoke with Delegate Rey on the phone. She drove up to Annapolis today to file to be a candidate for Delegate to the Republican National Convention, but the paperwork record she has does, in fact list her, as a candidate for President. Rey said that she thinks this is a “riot” and that at least one of her colleagues texted her calling her “Madame President.” She is going to work with the Board of Elections to correct the paperwork and register as she intended to do, as a candidate for Convention Delegate.